Are you getting married in London or perhaps you met you fiancée in London and want to have an element of London in your wedding décor? Our London Tube map wedding table plan can look great at your wedding. Name the tables after various tube stops in London, perhaps choose areas you have lived, been on dates, attended parties… perhaps he even proposed in London? The choice is yours. 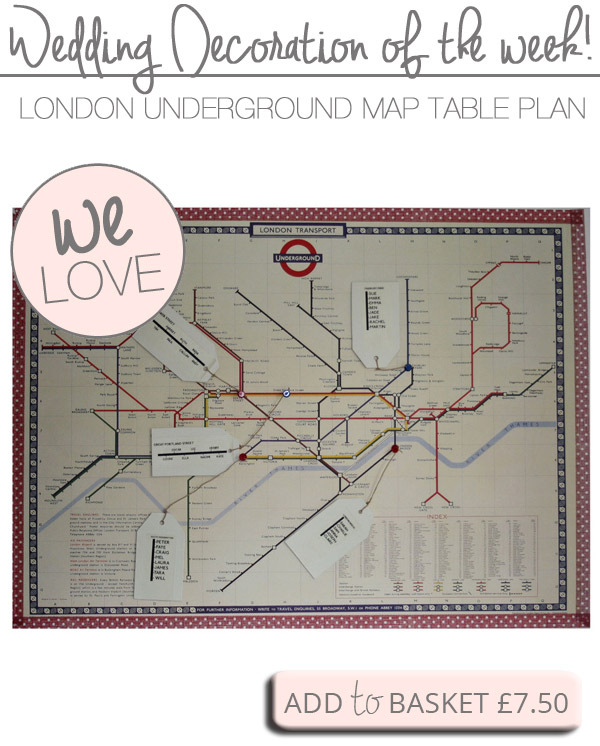 Our London underground map print could make the basis of a wonderfully unique wedding table plan. This vintage London underground map print measures 28″ x 20″ and is printed on archival quality Italian laid paper stock. Please note this is a vintage London underground map and does not have all the current underground stations. See below the steps to follow to make a table plan from our print. *Read our step by step tutorial showing how to make this London table plan here.